Want to try hitting the slopes but don’t think you can afford it? 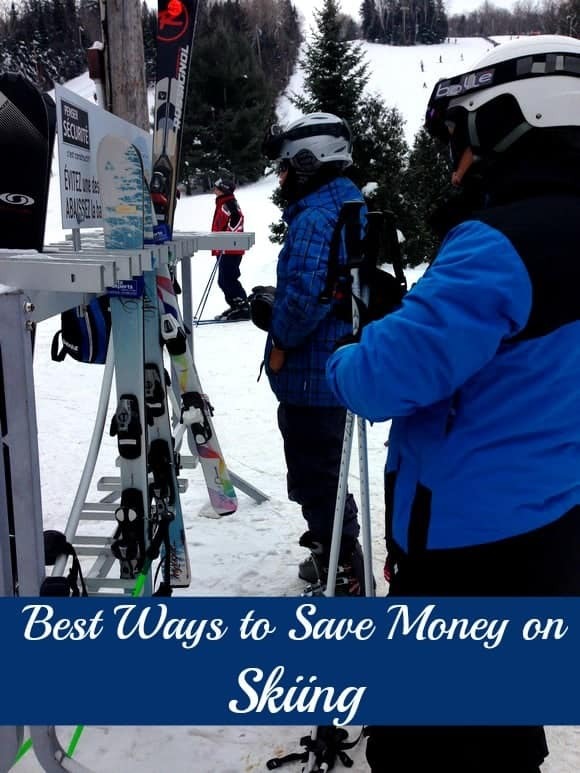 Take a look at some of the best ways to save money on skiing! Since we live in a country where the winter looks like Siberia sometimes and is very long, we had to embrace it in some way! One of the best way to go through the Canadian winter without getting depressed is to get involved in outdoor winter activities. One of our favorite ones is skiing! You can read how we started skiing and how I tamed my ski fears! Unfortunately skiing can be very expensive! Many people cannot afford it but with some creativity you can practice this great fitness activity and save money! The following tips will show the best ways to save money on skiing! Like any other sports, skiing has two aspects that cost money: equipment and membership! Both can be expensive! Many people think that skiing equipment is the most expensive aspect. Actually, this is not totally true because once you buy your equipment, you don’t have to renew it yearly! Membership or lift tickets must be renewed each year. Ski equipment consist of ski boots, skis, stick, a helmet and ski underwear! There are two options for the ski gear: buy or rent! I do not recommend renting helmets for safety and hygiene reasons. You can buy them early September at Costco or any ski shop. You can also buy them at the end of the ski season where you can score the best deals. That leaves us the ski boots, skis and sticks. Rental or Purchase: Which is the best way to save money on skiing equipment? Renting is perfect for an occasional skier, someone who goes once a year or a beginner who is not sure about this activity. It’s also great for kids! For $100 for the season, you can rent the ski gear from second thrift stores. We never bought skis for our kids: it is a waste of money because each year we had to buy bigger boots! All the ski stations offer rental options. I find them very expensive. Average cost is between $30 to $50 a day! So I do not recommend them. The best way to save money on skiing rentals or any ski equipment is to start preparing yourself very early. Start looking for good deals in the beginning of October or even September. Purchase: This is great for someone who skis on a regular basis! There are many ways to save money on ski equipment. You can buy them used from ski shops or buy new ones at the end of the ski season. Look for warehouse sales where the prices can be 30 to 40% less! Ask your friends and family if they know someone who wants to sell their ski gear! You can expect to pay $100 for boots on sale and around $300 for skis! I know it is a lot of money but it is a one time expense: you don’t have to change them each year! Lift tickets can cost between $30 to $70 a day and season passes cost between $500 to $600! That’s a lot of money! Again, if you are an occasional skier, lift tickets are better for you. If you are a regular skier, then you should go with season passes. Many ski stations have different kinds of packages that will suit. I remember the first year of skiing, we bought a package of 10 lift tickets of 4 hours duration! It cost us $10 per ticket! That’s less expensive than a meal in a restaurant. When you are an occasional skier, or a beginner, you don’t need more than 4 hours of skiing! I mean, you will be almost beat dead after that! So we used to arrive at the station at 10..30 am, ski 1.5 h until lunch and then ski 1.5 after lunch! If you don’t want to buy a package, you can consider skiing in the afternoon after 3 or at night! It is much cheaper! Season passes: Many ski stations offer a nice promotion at the end of the ski season to guarantee their following season sales! Check them out! If you miss them, don’t worry, check early season passes where you can score great deals too! Some ski stations team together and offer you nice savings too! Skiing remains expensive but we think of it this way: it keeps us healthy during winter, kids are hardly sick, we avoid the risk of winter blues and depression! In the long run: It is money spent on our well being. What are your best ways to save money on skiing? Share them with us! There isn’t a lot of snow yet on the ground but these are tips I plan to keep in mind when it comes time to picking an outdoor winter activity to do. Speaking of which, I never realized season passes being sold for the next season and being able to score deals on them That’ll make choosing what to do even easier. You make some valid points. I didn’t do a lot of skiing growing up due to the cost, even though I grew up wth a lot of snow in the Upper Peninsula of Michigan. Proud yooper ! Skiing is such a fun thing to do but can be $$ there are so many great ways to get involved! First research your local ski area. Many have blogs and tips right on their website. As far as lift tickets the best option are season passes with blackout dates to start. Or buy packs at Costco if they are available in your area. As far as equipment buy a helmet and goggles. Both are available relatively cheaply. But between possible lice or pink eye saw yourself the anguish! Go into a local shop if you can and let them know that you are starting your family out and need advice! Just as we all try to shop local this is one way to ensure a good relationship! Most small shops have rental kids programs where you rent for a season. This way you are getting the best fit! Only buy from ski swaps if you are an experienced skier. Clothing is much easier than this. 1. NO Cotten! Fleece is fleece try old navy! We are fortunate that my husband is in the ski industry and we have access to more than the average. My kids still wear old navy. Buy one pair of ski socks don’t use fabric softener and use them only for skiing. Don’t use more than one sock! Remember if everyone is warm everyone’s happy! Have fun! There’s nothing like spending the day with your kids outside all doing the same thing! Great Tips Wish I Learned How To ski Looks Like So Much Fun!! Great tips. I have only been skiing once but would want to go again. I love skiing so much! I used to go all the time when I lived in Canada. We always bought our equipment secondhand to save money. Some of my favorite childhood memories were made on the slopes! Great tips. I use to love skiing in Quebec until I skied in BC… Honestly, I had no idea that you don’t have to ski in -20 degrees… The tips were really useful. Thanks for all the tips. One of the best things we did to save money when the kids were young is to network in the neighbourhood to find familys that also skiied, and then trade, give, or buy equipment between us. We benefited from hand me downs for many years, and were really happy to pass them on to others. This a fantastic way to cut down on costs! We trade with other families too and it helps a lot! Great tips. I have always found buying the pass ahead of time a big money saver. So true! I think we score the best deals when we shop early! It has been years since I have been skiing, but I would love to give it a try again when the kids get a little older. Can you Shop on A Budget and Still Eat Organic?